One of the largest international media art festivals, CYFEST was founded in St. Petersburg in 2007 by independent artists and curators. The festival promotes the emergence of new forms of art and high technology interactions. CYFEST’s goal is to develop professional connections between artists, curators, engineers and programmers around the world to expose wide audiences to robotics, video, sound and net art. Over the last decade, CYFEST has featured artists from Russia, USA, Germany, Japan, Canada, Argentina, Brazil, Finland, Italy, the Philippines among other countries. For its 10th anniversary, CYFEST significantly expands its international reach to present projects in America (New York), Colombia (Bogotá), and Mexico (Mexico City) as well as programming in Russia (Krasnoyarsk, Moscow, and St. Petersburg). In St. Petersburg, CYFEST has had partnerships with respected classical and experimental art institutions including the Scientific Research Museum of the Russian Academy of Arts, Museum of Applied Arts of St. Petersburg Stieglitz State Academy of Art and Design, Youth Educational Centre of the State Hermitage Museum, Taiga Creative Space, Luda Gallery, Golitsyn Hall, and St. Petersburg Sound Museum. CYFEST 10 is curated by Anna Frants and Elena Gubanova. The exhibition project “Interpretations”, accommodated in the building of Academy of Art, the oldest institute of higher artistic education in Russia, first and foremost raises questions of compatibility of the classical formal language and contemporary art that uses new technologies. This exposition of multimedia objects that is unusual for these halls establishes a delicate connection between the notion of multimedia and the aesthetics of artistic traditions. The interpretation (artistic explication) of an artwork was widespread even back in the Renaissance era. There were conflicts between Michelangelo and Raphael about borrowing figures and subjects. In art history, we could trace the interpretations of entire styles that, in their turn, grew into new styles and movements. Among copies of the paintings by Raphael and Titian, contemporary artists create plastic and conceptual rhymes to the works of other eras in the huge halls of the academy museum. The Titian Hall has the tone of European museums. The action in all the works exhibited here is slowed down and feels like a dream or a memory. This precisely corresponds to the exhibition’s subject: scrutinizing, rethinking, interpreting. The participants of the exhibition “Interpretations” are from different countries andcities, but they are united by their investigation of the changes that take place in the world – in the speed of life, speed of data transfer and sensations of the human being in space. Many of these artists resort in their works to an interpretation of the classics, thus demonstrating the profound interrelation between new and traditional works of art. Donato Piccolo offers his own interpretation of some of the greatest masterpieces of the 1600s and 1800s, in a educated, humorous and slightly destabilizing way. 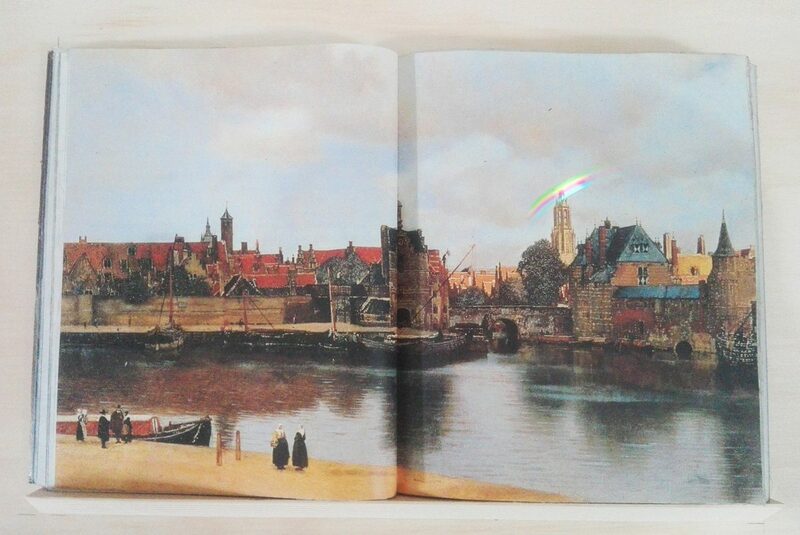 A rainbow turns the nostalgic “View of Delft” by JanVermeer into an hymn of joy, and the romantic landscapes of Caspar David Friedrich becomes apocalyptic with the irruption of two meteorites, as if the contemporary interpretation of Sturm und Drang could find the highest point of Romanticism in a vision of the end of the world. Donato Piccolo’s work is a game that has no rules, and can distort or emphasize what the original author intended.